Approval of the minutes of the Commission meeting held on November 14, 2018. Discussion regarding the adoption of certain fees and other charges for projects proposed in the I-195 Redevelopment District. Public Hearing regarding the adoption of certain fees and other charges for projects proposed in the I-195 Redevelopment District. 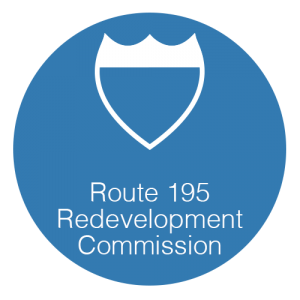 Vote regarding the adoption of certain fees and other charges for projects proposed in the I-195 Redevelopment District. To consider and act upon such matters as may be considered at a meeting closed to the public pursuant to Rhode Island General Laws, Section 42-46-5 (the Open Meetings Law) and 42- 64.14-6(i) (the I-195 Act), specifically matters relating to the sale of District real estate where the discussion in an open meeting would have a detrimental effect on the negotiating position of the Commission with the other parties to the negotiation. Discussion on the proposed development on Parcel 42 by The Fane Organization. Discussion regarding terms of Purchase Agreement with The Fane Organization on Parcel 42 and Vote regarding the execution of Purchase Agreement. Presentation by Tim Love of Utile, Inc. regarding the three development proposals on Parcels 2, 5, and 6 presented at the Commission meeting on May 9, 2018. Discussion on the east side parcels (Parcels 2, 5, and 6) presented at the Commission meeting on May 9, 2018. Discussion regarding the east side parcels (Parcels 2, 5, and 6) presented at the Commission meeting on May 9, 2018 and Vote regarding the selection of a preferred developer. Discussion regarding the issuance of a Request for Proposals for Parcel 6. Vote to consider the application of the District for the allocation of funds from the I-195 Redevelopment Project Fund for the purposes of constructing temporary parking on Parcel 28 and providing temporary parking in property adjacent to the District. Did they push back discussion of the east side of the river proposals? when are you reporting result of V-parcels 2, 5 and 6? I don’t know what they voted on, minutes have not been published for this meeting yet. This is the presentation that was given regarding those parcels. How is this tower a good idea? Plenty of other ways to get money spent on that site/and in Providence. Comments suggesting politics reason for Elorza’s opposition to tower; from my perspective, argument goes other way: politics reason for CC override . Please explain! Eliot. The Fane Tower shows that the state’s incentive packages are out of whack. An open lot between the train station and Kennedy Plaza makes more sense for a building of this size and stature. However, the state threw a ton of I-195 site money at Fane. The tower’s placement is based on free state money.